Stenhousemuir drew 1-1 at Pittodrie to set up tomorrow night's replay at Ochilview. 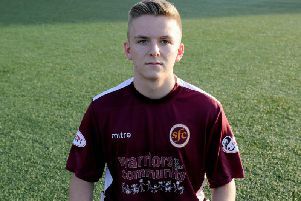 Stenhousemuir’s latest signing is looking forward to the Warriors Scottish cup fourth round replay on Tuesday night, following last weeks heroic draw at Pittodrie. Mark McGuigan’s 71 st minute header was Stenny’s only shot on target, but the League One side won’t care as they earned the right to do it all again on their own patch. 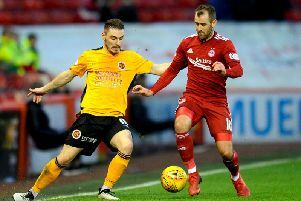 Aberdeen have never beaten Stenhousemuir and Colin McMenamin’s team won’t want to be the first set of players to allow the Dons to reign victorious at Ochilview. February 1995 saw third tier Stenhousemuir beat the Dons 2-0, in what went down as one of the biggest upsets in Scottish cup history. Stenny new boy Andy Munro has enjoyed his first two games in maroon and is confident his side will make life very difficult for The Dons on Tuesday. “We just need to go out and enjoy it,” he said. “We’re still in the game, we’ve got to go and make it as horrible as we can for them. Munro realises the importance of a cup run for clubs like Stenhousemuir and agrees it is a huge game for the club and fans alike. Aberdeen will be looking for revenge on Tuesday night following what Dons boss, Derek McInnes, described as a ‘real disappointment’. However, Munro insists Stenny still believe they can get something from the game. “We are just two teams,” he said. “They are just humans like everyone else. We’ve got to believe, there’s no point going out and expecting to get slaughtered. The Warriors faithful are hopeful for a repeat of that famous cup win against the Dons in 95, and Colin McMenamin’s side will be looking to provide the club with another historic upset.